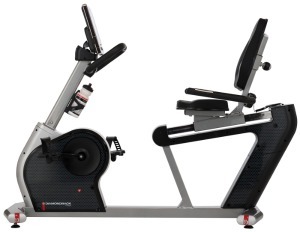 With new entertainment features, the upgraded Diamondback 510Sr recumbent exercise bike will keep you motivated and occupied for hours of pedaling workouts. Along with an MP3 plug-in and built-in speaker system, the bike offers a sturdy frame and smooth performance for a comfortable low-impact workout. The Diamondback 510Sr recumbent exercise bike has a bright blue LCD window on the console showing workout stats and a scrolling message center guides the user through the program set-up. The readouts show total time, segment time, watts, distance, calories, RPM, speed, and resistance level. The Heart Rate segment of the window shows BPM (beats per minute), and features a multi-colored Target Heart Rate zone. Check out the 510Sr Recumbent On Sale at the Company Store! The Diamondback 510Sr recumbent exercise bike features a heavy 125-lb frame, a 14-lb flywheel, sealed bearings, and a Poly-V drive train. The quiet, frictionless eddy current brake system provides 16 increment levels of resistance. The sculptured Comfort-Plus seats are extra wide for comfort and the molded backseat provides lumbar support. The step-through frame style allows for easy on and off, and the console and handlebar tilt for a customized fit. As an added bonus, all Diamondback Fitness models come with a free water bottle and holder. 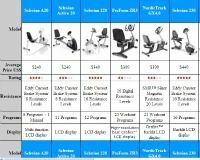 The display is easy to use and takes you through the steps to set up a new exercise session. For example, it prompts you to enter your age and weight before the workout to determine accurate HR readings. 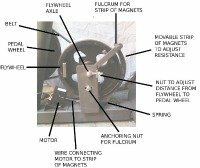 There are also QuickSet program keys to let you start your favorite workout with a single button, or of course, you can just get on your exercise bike and start to pedal in a manual mode. But with 20 different programs and 16 levels of resistance, you will want to take advantage of all the Diamondback 510Sr recumbent has to offer. You can also take a look the 510Ub model as well, which is the upright counterpart to the 510Sr. They are basically the same bikes with a few minor differences besides the seat itself. Reviews on Diamondback exercise bikes are very favorable and many users mention that the 510Sr delivers all the features you are looking for: quiet operation, solid frame, easy mount and dismount, smooth pedaling action, comfortable seat, simple console, and great entertainment options. You should also take note of the favorable 3-year parts warranty and 1-year in-home service coverage. The Diamondback 510Sr recumbent exercise bike offers a lot of value for its $799 price, and it rates a Good Buy.